Noraysa Arumpak strives daily to put a sense of normalcy in the lives of her nine children, but reality keeps catching up with them. “The last time we had fruit salad was during the end of Ramadan,” she recalls, from Pantar Elementary School, an evacuation site in Iligan City. She harked back to Eid’l Fit’r on June 26, which would have been far grander if only it was peacetime in their home in nearby Marawi City. It becomes harder to establish a sense of home when your kids wake up daily to the sight of four other families living in the same school room. The thought of sharing cramped spaces prompted Normina Ali, also from the besieged city, to leave the evacuation center. She remembers the tiring journey from home. When a terrorist group commenced the Marawi siege on May 23, Normina and her family fled Dulay Proper on foot. They first headed to Kapai town 38 kilometers away. They travelled another 20 kilometers to get to Balo-i town, then another 20 to reach Iligan City. She was due to give birth when that exodus happened. 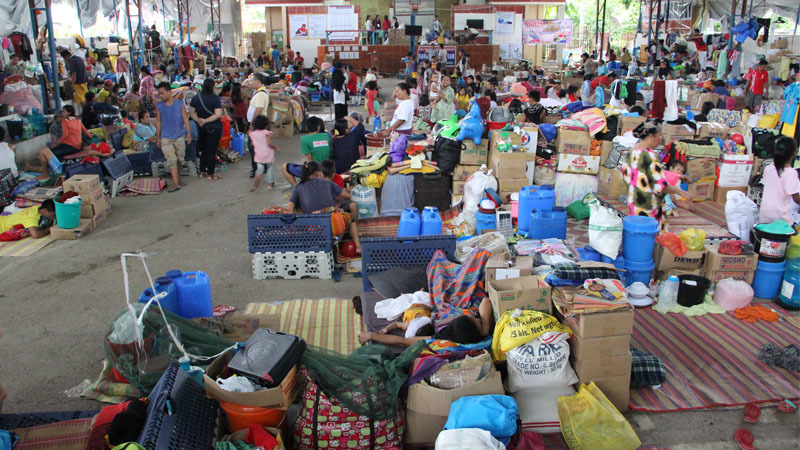 Normina and members of three other families decided to seek other places to stay because the evacuation centers were already full when they got there. The 19-year-old, who only recently gave birth to her third child, knew her kids were better off elsewhere. Already 400,000 individuals have been dislocated by the armed confrontation in Marawi City, the country’s only Islamic City and, thus, an important land for Moro people (tribes who identify themselves as Muslim Filipinos). Many of the IDPs, like the two mothers, are Maranao, one of the Moro tribes. Noraysa is the usual picture of an internally displaced person (IDP), who stays at the evacuation centers. Normina is categorized as a home-based IDP, someone who moved but chose not to stay at the designated sites. They are two women enduring two different situations, but experiencing the same problems of motherhood. 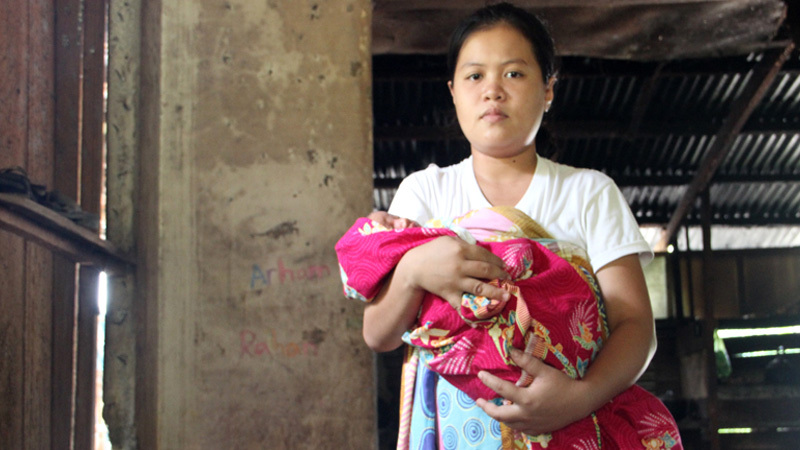 Mothers and children in evacuation centers, like Noraysa, are exposed to the dire situations there. The usual diet of sardines and noodles uncovers the issue of malnutrition. The centers lack water and sanitation facilities. Mothers ask for diapers for their babies. Children are suffering fever, cough, colds and diarrhea. Deaths have been reported. Meanwhile, home-based IDPs rarely receive help as relief efforts go straight to the evacuation centers. Tracing them would entail much work, from coordination with village chiefs to house-to-house interviews. This demographic is, as a consequence, largely undocumented. IDPs based in evacuations centers are 10 percent of the total number. The rest are home-based. The stories of Noraysa and Normina reveal the challenge of moving forward. Many IDPs are uncertain of what lies ahead. Most haven’t undergone proper psychosocial debriefing and health assessment. Fathers search aimlessly in Iligan City, looking desperately for any way to earn money. There is no clear roadmap for livelihood. The government is unprepared to take on the issue of displacement, exacerbated by the implementation of martial law across Mindanao. With the unrest raging on for nearly two months now, sectors – including the religious – are troubled that relief efforts may die down. The two combined could spell a more difficult life ahead for Noraysa and Normina. Regardless of that bleak possibility, both share a hope for peace in Marawi. Normina breaks into a smile cradling in her arms her baby daughter, Ashari. She worries about the sustenance of her youngsters, but refuses to accept that her kids would grow up amid the restlessness of war. All this optimism comes from IDPs who would usually hear Marawi as a distant explosion or see it as black smoke billowing from razed properties, probably their own homes. For them to continue yearning, then, help is key. “I hope that relief agencies would continually reach out and help us,” Normina says. As an ecumenical response to Marawi, the NCCP Operation Paglingap continues its call for support in cash or in kind. 879 EDSA, Brgy. West Triangle, Quezon City. For your support, you may contact Ms. Carina Pamintuan at (02) 921 0939 or 0908 864 2477.